Scientific methods to accelerate your learning to save time, beat competition, and get from point A to point B at the speed of light. Applicable and actionable advice - not just theory and description. Work smarter, not harder. 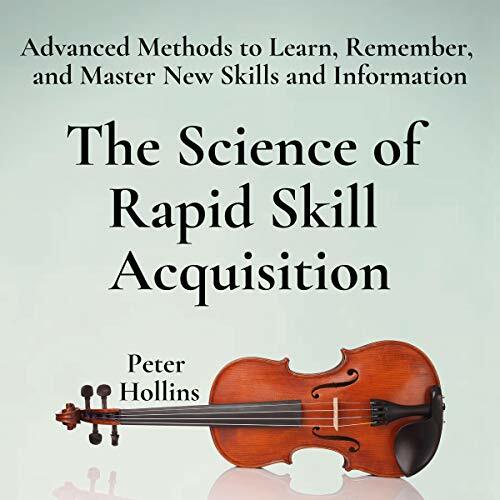 The Science of Rapid Skill Acquisition is the definitive resource to get you where you want to be in terms of a new talent, skill, or ability. You may not realize it, but each day is a set of skills and tasks that we repeat. Each hobby and interest is also a set of skills and tasks. This audiobook focuses on what matters in processing information and being able to use it effectively to your advantage. Rapid skill acquisition is how you get ahead in life professionally and personally. Learn to rapidly train your brain and develop muscle memory. Understand the underlying psychology and biology. Tactics that top-one-percent performers and competitors use. Theories and principles of learning and what we are doing wrong. How your expectations matter more than your amount of talent. How to make a plan to strategically deconstruct and analyze information and skills. How to get better results while working less. Surprising methods to utilize the people and environment around you. The art of practicing, pivoting, and correcting yourself. How to stack your skills and become a unique resource. Take advantage of learning science to best absorb info. Learning slowly and inefficiently will lead to your downfall - or even worse, being average. We live in a fast-paced world. Will you fall behind or take the lead? The choice is yours - learning unlocks the doors to everything we want in life. Accelerating that process makes your life easier and more fulfilled. Personally, your interests and hobbies will grow at a quick pace for more enjoyment. Professionally, your career opportunities will skyrocket because of your newfound proficiencies. Start your journey rapidly by clicking the "Buy Now" button at the top of this page! The book was very interesting and not only explained some better ways to learn and study but it was also enlightening as to why some people see things differently based on the way they learn. The educational side of it was interspersed with anecdotes and examples from the author’s life. It was very enjoyable for a book about learning. As an audio book the only downside was that I felt as some points I should be taking notes. There were great summaries at the end of each chapter similar to a text book. I would suggest to the author to look into the option to provide a brief pdf outline with the audio book as there were several lists and suggestions I wouldn’t mind having written down. Lots of great ideas on how to acquire new skills. I knew or have heard most of what was in this book already, but this lays it out for you to easily understand. I recommend this to anyone who needs more knowledge in this subject. Science of Rapid Skill Acquisition is much more aggressive in what you should and should not do where as the Build a Better Brain was more academic. I strongly believe that the skills and methods the author writes about should be taught in the middle school level, if not earlier. How to learn is much more important than what too learn. Russell Newton is a fantastic narrator. His voice and diction are well suited for this type of material. Incredibly useful and interesting book! I am listening to this book for the second time! Lots of interesting ideas on how to acquire new skills, and various methods so you can find the ones that best fit you. This is my second book by Peter Hollins and wow! I am already putting what I learned into practice, and highly recommend this this book. I wish I had this my high school year, would have changed my entire perspective on learning!!!! Well, as someone who is quite interested in personal development there wasn't something entirely new to me in this book, but still it was 4 hours well spend for me. The information was legit, well-structured and told. Narration was decent and I didn't felt lost anywhere. It was good for me to refresh and reinforce my knowledge and I believe it would be a good book for people who haven't read much or made research on personal development before. Thanks you Peter for those valuable ideas and information in this book regarding learning; it was very inspiring. I was worried because in the first edition, one said that the Audio quality was owful. I did not see this problem in this recording and it was clear.